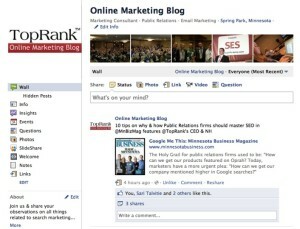 You are here: Home / New @TopRank / How Can I Make My Company Facebook Page Search Friendly & Use it to Engage My Followers? How Can I Make My Company Facebook Page Search Friendly & Use it to Engage My Followers? An optimized and engaging Facebook presence as part of an Internet marketing strategy can be very valuable to small and large businesses alike. However, what are some of the steps that lead to an optimized and engaging page? It doesn’t happen overnight but below I’ve listed some helpful tips for getting started. Know Your Audience. Take the time to learn your audience as well as your competitors. What Facebook pages do your potential customers like? What sort of information are they sharing? By identifying and researching your customers you are able to identify what they are doing well (and wrong) and how users are responding to the information that they are providing. Use Relevant Keywords. Not only does Facebook have it’s own robust search engine but the content housed on Facebook also filters through to other search engines such as Google and Bing. 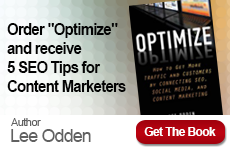 Optimize your information and content the same way that you would any other digital media. Using relevant keywords and keyword phrases will increase your changes of visibility. Interact Regularly. Facebook is not a one way street. Simply soliciting followers to become “fans” of your page is a one sided marketing strategy. 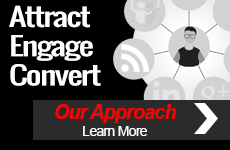 There are some very simple actions you can take to increase your visibility. For example you may want to consider following prospective clients that you have identified. If you find a post of theirs interesting take the extra step to not only “like” the information but interact with it as well by posting a sincere comment responding to the topic. Be Friendly. Brands, individuals, and organizations like to interact with people that are friendly. Inserting personality and personalization to posts encourages others to share your content. In order to increase your following provide information on things that people like that will encourage further communication or next steps. Create Strong Calls to Action. Asking questions is a great way to encourage interaction with Facebook users. However, what other tactics can be used to inspire engagement? There are a variety of free tools available to create polls, surveys, and run contests to encourage interaction with your Facebook audience. A simple landing page that offers “10 tips on improving your marketing strategy” for filling out a couple lines of contact information is also a great way to entice your audience to take next steps. Because you are offering something of value that can be applied their business they will be more likely to participate. As with any other marketing initiative your Facebook presence should be an ongoing strategy. You should be constantly researching, creating fresh content, monitoring results, and adapting your strategy to improve results.